South Canterbury in the Central South Island NZ has a lot to offer in the equine arena, but that’s hardly surprising as one of the greatest racehorses of all time originated from right here, the legendary New Zealand horse Phar Lap. The region’s central South Island location and undulating pastures have led to a strong equine fraternity. Activities range from local pony clubs, horse trekking for beginners to the more advanced through to professional breeding, racing and training centres for both the thoroughbred and harness racing sectors. Horse mad, or just out for some healthy exercise in the country air, you'll enjoy a few hours or full day out with local horse trekking operators. Browse our South Canterbury business listings and talk to the friendly team at the Timaru or Geraldine Visitor Centres for more details on one of the best ways to explore the stunning South Canterbury countryside - on horseback! 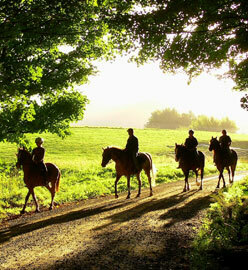 Experience the spectacular Mackenzie High Country on horseback. Come and meet our enthusiastic team and friendly horses. Let them take you on a memorable trek through tussock grasslands, forests, high country sheep stations and grand picturesque glacial lakes.